Many bat species hunt and migrate at great altitudes. The range of the open sky is a new interest area as a habitat relevant to a large variety of species. Christian Voigt and colleagues from the Leibniz Institute for Zoo and Wildlife Research (IZW) in Berlin have collated the current scientific knowledge on potential hazards to bats flying at high altitudes. In their recent article published in BioScience the authors synthesise threats facing bats in the troposphere and provide recommendations for potential protective measures to ensure the persistence of bats and other high-flying animals. Bats reach surprising altitudes while out on their nightly hunt. They utilise a large area to forage, stretching from the treetops to the lower troposphere. Bats have been recorded using onboard GPS loggers at heights of 500 metres above the ground in Germany, reaching up to 800 metres in Thailand. Yet the current record holder is the Mexican free-tailed bat Tadarida brasiliensis which has been recorded at the lofty height of 3000 meters above the ground! Even species like the common noctule Nyctalus noctula, inhabiting much of Europe, can reach altitudes above 1000 metres. Thus the high altitudes are an underappreciated habitat for bats and this region has largely been ignored in species conservation efforts. There are currently no specific policies or concepts for aeroconservation in Europe even though 21 of the 53 bat species native to the continent hunt for insects in these open spaces. "When we think of the term habitat, we generally think about features in the landscape: meadows, forests, or bodies of water, and other Earth surfaces," says Christian Voigt. "The lower boundaries of the troposphere escape our attention as a habitat relevant and important to animals." Yet they are full of life. Both birds of passage and many insect species migrate at high altitudes. "Insects use winds to cover distances that they would not manage on their own." It's no surprise that bats use this open space: It's where their food is. Insect density varies by region. Their numbers have also generally declined due to air pollution and the increased use of pesticides across the globe. Voigt and colleagues estimate that to bats the open sky is further fragmented into 'food-rich' and 'food-poor' zones. 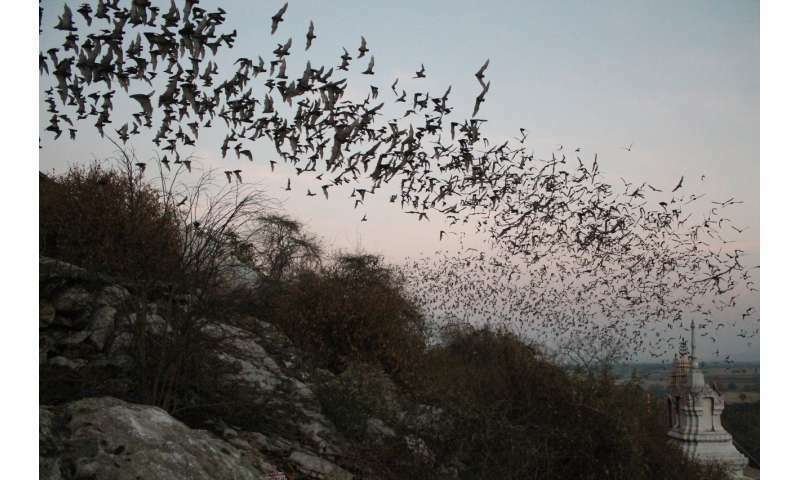 Large clouds of bats in South East Asia can, depending on the species, cover distances of up to 40 or 50 kilometres during their nightly foraging. Analysis of radar data from North America illustrates that they span out in all three dimensions covering large swathes of land. "Some bat colonies consist of one, two, or even ten million individuals. Not all of them can locate their prey nearby and they have to utilise high altitudes. There they also feed on insects harmful to human agriculture," Christian Voigt explains. The animals are exposed to a variety of threats while hunting in the open air. Collisions with anthropogenic structures like high buildings, wind-power farms, drones, helicopters, and airplanes are direct impacts of human activity causing injuries and potentially death. With the increasing volume of air traffic and utilisation of wind energy sources this human influence is a growing threat. Aside from reduced insect density, indirect impacts include light and air pollution, like dust and chemical pollutants, and exhaust fumes all of which can result in impaired health and reduced reproductive fitness. "Bats are winged athletes. We have observed two species which ascended and descended several hundred metres repeatedly in a very short timeframe. To do so requires immense effort, leaving the animal potentially highly vulnerable to air pollutants," Voigt emphasised. In addition, as nocturnal animals bats are highly sensitive to light pollution and the relationship between bats and artificial light at night has yet to be determined at such high altitudes. Protecting the open sky is far more difficult than conserving clearly defined terrestrial and aquatic habitats. "It is, basically, the same predicament as with the oceans. The open sky is in public hands and common property which makes accountabilities harder to disentangle, and controls difficult to enforce," says Christian Voigt. Bats are the only mammals capable of flight. Next to their immediate worthiness of protection, bat conservation is also of direct economic interest to humans as bats provide agricultural pest control services across the world. A number of practical aeroconservation approaches do already exist. "A variety of long-lasting protection strategies have been developed. In Germany, at least, wind power plant operators have to comply with a variety of permit requirements that are designed to limit bat and bird casualties. Unfortunately, how well these are implemented, across the country, is currently unknown," says Voigt. The migration corridors and roosting and resting areas of bats and birds have to be kept free of wind power plants. Strategies to reduce the impact of light emission and sky glow to bats are simple and efficient. Focus light toward the ground and limit light spill toward the sky! Voigt and colleagues urge for an expansion of research into the troposphere as an essential habitat as it is crucial for us to understand how the animals that exist in these open spaces can best be protected.